A quick card for a couple of challenges over at Splitcoast today. First and foremost…for the Hope You Can Cling To Challenge, Judy has given us some lyrics and a video to watch….the Monster Mash. My inspiration came from the colors. And Steph has asked us to use at least two round elements on our cards today. And so the round bumps from the bubble wrap stamp and the round rhinestones on my bling definitely qualify. I simply inked the bubble wrap stamp with three colors of Distress Inks, spritzed it, stamped it off on some scrap paper, then stamped it on my card. 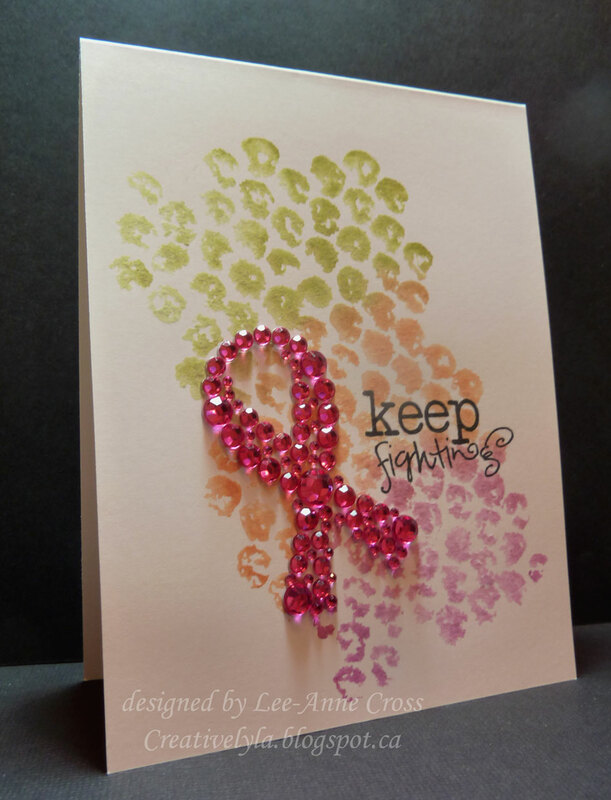 Next came the sentiment from Verve and one of my favorite embellishments for this month…the pink ribbon of hope. Doesn’t get much easier than this does it? I just love that bubble wrap background. And the sentiment and ribbon bring so much meaning to this simple design. Fabulous!